The Hospitaller Order of Saint Lazarus of Jerusalem was founded in 1995 with its Supreme Grand Priory based in Scotland, Great Britain – represented by means of its Supreme Grand Prior, H.E. Richard Comyns of Ludston – and the Grand Chancellery is located in Malta. The First International Lazarite Symposium of the United Grand Priories of the Hospitaller Order was held in collaboration with The Union Corps San Lazare International – which is head-quartered in Vienna, Austria – between 18-22 April 2012, to which event the associated federations and knight orders were invited as well. Many people arrived to the I. International Symposium from Europe and from other continents, where the knights and members of the Order live and operate. The First International Symposium was held in Valletta, the Capital of Malta, a city built by the knights of Malta after the fabled Great Siege of 1565. All the conferences of the Symposium and the solemn investiture ceremony itself were organised at the historic Mediterranean Conference Centre – in the Cotoner Hall. For centuries, the hospital of the Order of St. John, the „Sacra Infermeria” or Holy Infirmary – which was started to be built in 1574 – has worked in this building. The completed hospital earned the rank of Europe by its physicians, nursing staff and equipment, and last but not least thanks to its great leaders. In the basement rooms of the impressive-sized building the exhibition on the history of the hospital can be found: pictures, wax figures, original objects and tools help to learn about the institution, where beyond local people the patients of the European countries were also successfully cured. The opening reception of the event was held in Zebbug, where the permanent office of the Grand Chancellery was solemnly inaugurated with the participation of all the present guests. Modern chivalric and Hospitaller organisations – working in harmony with European and international institutions: EFUS, etc. Numerous orders and organisations – including the Vienna-based CSLI – have joined the Hospitaller Order of Saint Lazarus, the announcement and description about that happened at the conference. 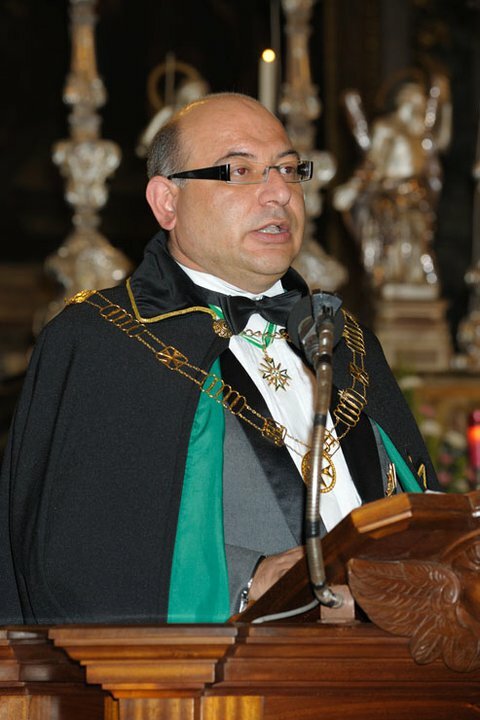 HMEH Prince José Cosmelli – Grand Master of the „Sovereign Order of Saint John of Jerusalem, Knights of Malta, Federation of the Autonomous Priories” (KMFAP) and H.G. George Popper, the Lieutenant General of KMFAP also attended the event. Knights and Dames on behalf of the Sovereign Order of Cyprus and the Ordo Hungariae were present as well. During the conference, in his speech, the Grand Master of KMFAP introduced the Knights of Malta, its operation and activities, highlighting the humanitarian work and its organisation, the FEMERAID. On this special occasion, the highest-ranking leaders of the Order of Saint Lazarus and the Knights of Malta (KMFAP) declared their intention of cooperation between the two Orders. During the event it was also decided that the Saint Lazarus Special Rescue Group – which has already been operating very successfully for 25 years, and led by its Field Marshal, General David Zammit – joins the FEMERAID–Europe organisation. Finally dawned on Saturday morning, the day of the investiture ceremony. An extraordinary venue was chosen by the organisers: the conference room of „La Sacra Infermeria”, developed from its greatest hospital room, which is 160 meters long and rivals any nowadays built conference centres in its impressive size. Not only the size of this room is unique, but also its historical past and beauty. In former times the hospital beds – separated with curtains – were here, where also the great doctors of the Order of St. John worked, and our ancestors were cured, and a special part of the history of our Order was here as well. All this had a huge impact on everyone during the ceremony. 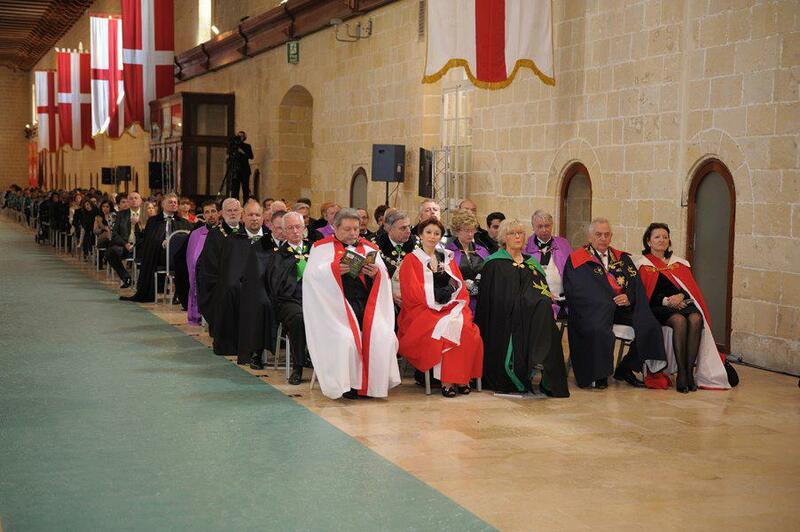 For the Ceremony of Investiture all the massive walls were decorated with large size, original historic flag-valance, in which the name and coat of arms of the 28 Maltese Grand Masters of the Order of St. John were visible: the history was really tangible to us. This inspired mood drifted into the great hall, which was beautifully furnished to the record number of appr. 700 participants. The choir gave a very well composed background music for the investiture, which began with the official entry, and the ceremony lasted about four hours. The inauguration took place under the Catholic liturgy, with the assistance of the Order's chaplains. There are significant differences from the KMFAP investiture practices and in the nature of the membership, since during the knighthood ceremony of the Hospitaller Order of Saint Lazarus most candidates became only members of the Order of different ranks (officer, commander), so for their initiation the sword was not used and they did not receive knighthood either. And this time, only a few candidates was immediately knighted. Numerous Grand Priors were also inaugurated, among others the Austrian and Slovakian Grand Prior: Ing. Peter Lednár, mayor of Zlaté Moravce (Slovakia). At a given point of the investiture took place the award ceremony, when HMEH Prince José Cosmelli – Grand Master of KMFAP was decorated with the Grand Cross medal of the Hospitaller Order of Saint Lazarus and in return H.E. Richard Comyns of Ludston – Supreme Grand Prior of the Hospitaller Order of Saint Lazarus received the Medal of Merit – Gold Grand Cross of the Knights of Malta (KMFAP). The extremely high quality and unforgettable ceremony of investiture was followed by a banquet in the ballroom of one of the most beautiful hotels in Valletta, in Hotel Phoenicia. At the end of this gala lunch paintings and knight's relics, including the sword of investiture were sold up. Sir Peter Lednár – Knight of Cyprus and Malta acquired the sword with his 1000.- Euro offer, and presented it to his father – the newly appointed grand prior. In addition, many guests of the banquet contributed to the financing of the Order's humanitarian actions with their donations.